It's not just about gluten. Learn what other factors may be causing patients troublesome gastrointestinal symptoms. Wheat, a key ingredient in our favorite crusty bread and delectable pasta dishes, can be enjoyed without consequence for the vast majority of people. Wheat is a complex grain, composed of various molecules of carbohydrates, proteins, and fat—many of which have been associated with putative health benefits such as providing prebiotic fibers, improving glucose homeostasis, and laxation effects. But for some individuals, wheat ingestion is associated with a cascade of symptoms from gastrointestinal (GI) distress such as bloating, cramping, pain, and altered bowel habits to extraintestinal symptoms, including fatigue, and memory and cognitive difficulties. For those with wheat allergy or celiac disease, wheat intake is prohibited due to deleterious immune-mediated effects resulting in villous atrophy and gut inflammation or potential allergic anaphylactic events. Wheat intolerance occurs in a broad spectrum of individuals with digestive symptoms, and aside from gluten, some of the lesser-known components of wheat that may play a role include fructans and amylase trypsin inhibitors (ATIs). Celiac disease is an immune-mediated condition induced by dietary gluten leading to small bowel inflammation and villous atrophy in genetically susceptible people. Celiac disease impacts about 1% or three million individuals in the United States.1 Wheat allergy, one of the top eight allergens, presents in about 2% of the population and, unlike most food allergies, incidence increases with age.2 Symptoms of wheat allergy such as hives, swelling of the throat, headaches, and nausea and/or vomiting occur quickly after consumption and may result in a life-threatening event. Because wheat has several components that may exacerbate undesired symptoms, dietitians need to understand the complexities of wheat to best guide their patients. William D. Chey, MD, AGAF, FACG, FACP, a gastroenterologist at the University of Michigan, says, "When laypersons develop symptoms after eating wheat, they assume it's the consequence of gluten. Indeed, the medical establishment has thrown gas on this fire by labeling such individuals as suffering with 'nonceliac gluten sensitivity.' It's growing increasingly clear that while gluten provides an explanation for symptoms in some patients, it isn't the culprit in many who develop symptoms after eating wheat." Wheat gluten, the main protein fraction of wheat, isn't completely digested, and these "remnants" initiate an immune reaction in those with celiac disease. How they also may play a role in initiating digestive symptoms outside of celiac disease is debated. Novel research in the area of NCWS is recognizing that ATIs from wheat may initiate GI inflammation. However, ATI ingestion leads to GI inflammation differently from gluten in celiac disease.2,8 "Nongluten proteins in wheat can exert proinflammatory effects in experimental models and could be responsible for the development of symptoms in susceptible patients," Chey says. "For example, ATIs are proteins that confer pest resistance to wheat. ATIs have potent proinflammatory effects and might be involved with the onset and perpetuation of celiac disease and other inflammatory diseases of the GI tract." ATIs activate both the intestinal and extraintestinal innate immune system. The immune system is divided into two categories: the innate immune system and the adaptive immune system. Innate immunity involves the body's first or early arriving defense mechanism that attacks an antigen (a foreign substance that induces an immune response) that appears in the body. The defense mechanisms are active in our skin or at mucosal surfaces, those contact sites between the exterior and interior of the organism. Innate immunity allows immune cells to immediately attack foreign invaders as well as toxic substances. The adaptive immune system acts in a more protracted and complex, but even more powerful, manner. This immune system has to first recognize the specific foreign invader. Adaptive immunity adapts and remembers the foreign invader, allowing subsequent exposures to the invader to be more efficient. The adaptive and innate immune systems often act together; proteins (chemokines and cytokines) in the blood help them communicate with each other to coordinate their response to any foreign substance. • Most people can enjoy wheat without GI distress. • Wheat has many health benefits from blood sugar homeostasis, laxation, and notable prebiotic effects resulting in butyrate production, a short-chain fatty acid shown to aid gut motility and lower colon cancer incidence. • Wheat may trigger symptoms including intestinal inflammation, painful gas, headaches, and brain fog in some individuals. • For those with IBS, NCWS, or autoimmune conditions exacerbated by wheat intake, removing or reducing wheat may offer symptom relief and should be considered as part of the therapeutic plan. • For patients with celiac disease or wheat allergy, it's necessary to remove wheat from the diet. • A wheat-free diet may result in a reduction of dietary fiber, as many rely on whole grain wheat to meet fiber needs; assess fiber intake and adjust diet to patient's tolerance. • Some gluten- and wheat-free foods lack the enrichment of vitamins and minerals found in US wheat-based foods, so encourage enriched options as needed to meet nutritional needs. — Kate Scarlata, RDN, LDN, is a Boston-based dietitian with expertise in food intolerances and digestive health. 1. What is celiac disease? The University of Chicago Medicine Celiac Disease Center website. http://www.cureceliacdisease.org/overview/. Accessed March 11, 2017. 2. Schuppan D, Pickert G, Ashfaq-Khan M, Zevallos V. Non-celiac wheat sensitivity: differential diagnosis, triggers and implications. Best Pract Res Clin Gastroenterol. 2015;29(3):469-476. 4. Hayes PA, Fraher MH, Quigley EM. Irritable bowel syndrome: the role of food in pathogenesis and management. Gastroenterol Hepatol (N Y). 2014;10(3):164-174. 5. Halmos EP, Power VA, Shepherd SJ, Gibson PR, Muir JG. 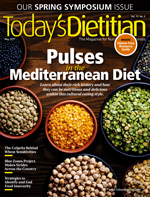 A diet low in FODMAPs reduces symptoms of irritable bowel syndrome. Gastroenterology. 2014;146(1):67-75.e5. 6. McIntosh K, Reed DE, Schneider T, et al. FODMAPs alter symptoms and the metabolome of patients with IBS: a randomised controlled trial [published online March 14, 2016]. Gut. doi: 10.1136/gutjnl-2015-311339. 7. Murray K, Wilkinson-Smith V, Hoad C, et al. Differential effects of FODMAPs (fermentable-oglio-, di-, mono-saccharides and polyols) on small and large intestinal contents in healthy subjects shown by MRI. Am J Gastroenterol. 2014;109(1):110-119. 8. Zevallos VF, Raker V, Tenzer S, et al. Nutritional wheat amylase-trypsin inhibitors promote intestinal inflammation via activation of myeloid cells. Gastroenterology. 2017;152(5):1100-1113.e12. 9. Junker Y, Zeissig S, Kim SJ, et al. Wheat amylase trypsin inhibitors drive intestinal inflammation via activation of toll-like receptor 4. J Exp Med. 2012;209(13):2395-2408.